Scenario: You have been asked to direct a music video. Before you start filming, you must produce all relevant pre-production material. Locations: London, Fulham, New College, Portsmouth Beach. Budget: Because my locations and group are in London my main budget is on the train ticket to get there and back. The total of this was £40.30. The only other thing that I have had to spend money on was the paint powder that I used in the video. For all four of the pots it was £15.60. This puts my total budget are £55.90. *After having to drive down to Portsmouth, my budget was then increased. The fuel was £25. This puts my final budget at: £80.90. My original inspiration came from the ‘Holi Festival’, where coloured powder is thrown around and used for the celebration. I thought that this would have a good effect within the music video. After I had a rough idea for what I wanted I started to look up, music videos and photo shoots that use coloured powder in them. My two favourite examples are; Summadayze – Colourfornia. (https://www.youtube.com/watch?v=zRmmquYLG6o) in this video, it is a group throwing coloured powder at each other, it also links to the song, ‘Calvin Harris – Colours’ which is about.. Colours. My other example is a photographer who does Youtube videos about his work, his channel name is ‘Photo Extremist’ (http://photoextremist.com/high-speed-powder-photography), this is a link to his page where it talks about his photo shoot where he use coloured powder. It also explains about the set-up he used when he did the shoot. This could help me by knowing where to film, what setting to have, what angles to use and what kind of light I should have. 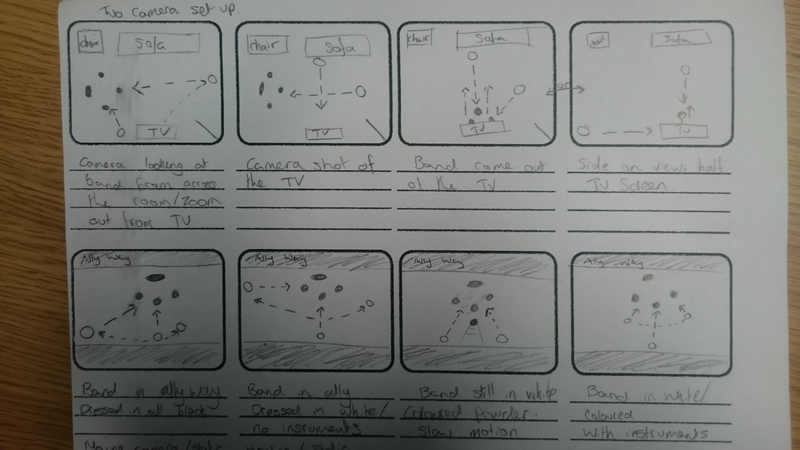 Below is a storyboard of the video that I am thinking to produce, it shows the different settings that I would like to use and the set up of each person. Hopefully if there are people willing to help, I will be able to have a two camera set-up, one static and one moving around getting different angles of the band. My two main settings will be a living room and an ally way, this is to give different tones throughout the video. The way I would like to incorporate coloured powder is, to have the band in white tops without their instruments but still playing the song, this is when the powder will be thrown at them. I am still discussing with the band if they want to be static while this is done, or if they would like to start moving around and having more fun, this could give the video a light-hearted tone that could work well with the rock genre that they are. On this storyboard there are a couple of different ideas shown, there is a camera looking at the TV/ the band is coming from that direction, this is still a possible option that I will talk to the band about when I meet up with them. After traveling to London, and filming some small parts of the music video the main performer Ben Davis, became very ill and couldn’t get out of bed. This made it impossible to film my idea of the paint powder. However I am now traveling to Portsmouth to film some UNI students on the beach, using my paint powder idea. This has left me behind schedule for the editing weeks, but by the ‘re-shoot’ week it should all be in order. Before I drove to Portsmouth, I thought I should try out my ideas, so that I could get framing and angles right for the day. I went to the drama department at college and asked for four students to help me. With these students I tested my paint idea on college grounds, however I used a cheaper alternative, flour. Some of the shots worked quite well so I have decided to use them in my final production. After being able to travel to Portsmouth to film some UNI students, to use for my paint powder idea, I had all the footage I needed to be able to edit. My new location was Portsmouth beach, South Sea. This gave a good contrast and deference of scenery. I was able to edit my music video during the re-shoot week. So I have been able to catch up.